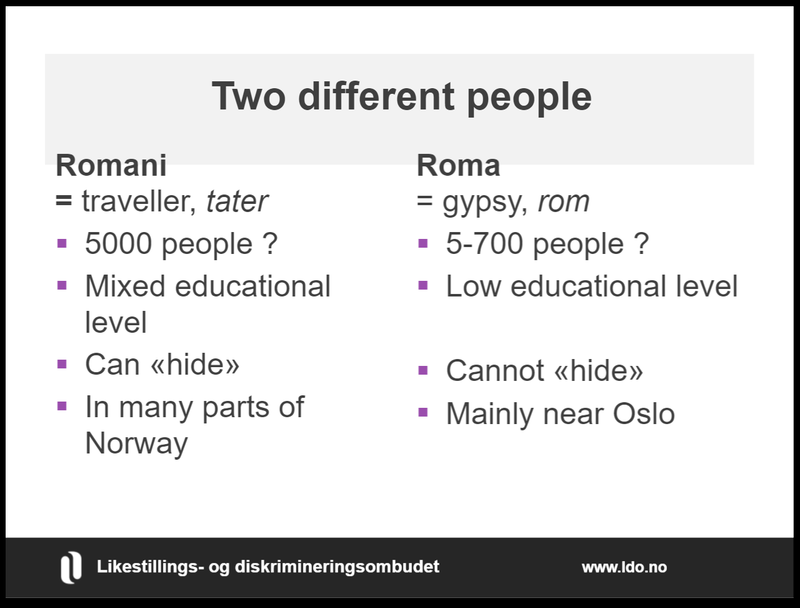 NORWAY - DREAMLAND FOR ROMA WOMEN? Norway is widely perceived by other nations as a successful example of how gender equality principles can be incorporated into, and practiced by, a society. However, we learned that Norway also continues to face difficulties harmonizing gender equality, with the realities of discrimination. Eero Olli, a political scientist and analyst with the Equality and Anti-discrimination Ombudsman, provided a historical overview of ethnic minorities and indigenous people of today's Norway, and the key political developments that have shaped public attitudes and policies regarding their communities. These social challenges were explored in more detail through a panel discussion and open dialogue with Roma and Romani women, and organizations advocating for their rights. We heard remarks from Monica Karlsen, Lillan Støen, Linda Aleksandersen, Sunita Lakatosova, Safira Josef, Diemanta Johnsen, and Inger Sigfridsson from the Roma Initiative of Oslo Municipality (see photo). The panelists shared their insights regarding the problems of ethnic discrimination on individuals, families, and communities. Discrimination has led to poor living conditions, barriers to housing and basic social services, as well as diminished educational and economic opportunities. For ethnic minority women, there is an additional set of burdens, due to expectations placed on them regarding their roles as mothers, homemakers, and caretakers. We also learned about the pressure to conceal women's identities, in order to claim the most basic rights and protections that are already articulated and guaranteed under the law, yet still ignored and denied by government and society. It was inspiring and important for us to see, hear, and learn from these inspiring women who have risked what they have for a chance to improve their lives under difficult situations. They not only are focused on their own personal development, but also building support and awareness within their communities to improve the services and resources available to them. These women are also organizing, with the help of NGOs and allies, to reframe the language around equality to be more inclusive of, and attentive to, ethnic communities. In April 2017, Spiralis was invited to participate in a three-day study trip to Oslo on the topic of gender equality. The study trip was organized by the Open Society Fund Prague, under the "Let's Give (Wo)men a Chance" program; and hosted by the Norwegian Equality and Anti-Discrimination Ombud (LDO). The study trip was designed to help Czech organizations learn from Norway's well-publicized efforts at promoting and enforcing equal opportunity protections. The aim was to determine what could be applied in the Czech Republic, through an exchange of perspectives and ideas with a diverse range of Norwegian policy and advocacy experts. Spiralis joined a delegation of nine Czech non-governmental organizations working on equal opportunities concerns including: Fórum 50% o.p.s., Gender studies o.p.s., Genderové informační centrum NORA o.p.s., Sdružení pro integraci a migraci, Lagardere Active ČR, Kostka Krásná Lípa p.o., Otevřená společnost o.p.s., and Ratolest Brno z.s. ​„Projekt podpořila Nadace Open Society Fund Praha z programu Dejme (že)nám šanci, který je financován z Norských fondů." More than 40 women leaders, representing prominent charitable organizations and mentors from the business sector, met to launch the Leadership Academy on 11 January at United Nations Information Centre. The Academy, hosted by Spiralis under the Spectrum for Women's Development program, provides an intensive, year-long, experiential study program for civically active women. This is a unique, first of its kind, professional training and personal development opportunity specifically designed to meet the needs of nonprofit sector women leaders. The initial class of participants was selected from across the entire Czech Republic, and represents a wide range of diversity of experience and expertise in solving social issues from the local to international level. The Academy will provide a safe space for nonprofit women executives to build their peer knowledge networks, to test and exchange their ideas, to expand their professional skills, and to strengthen their personal confidence and social influence. "These women are unique in how they sensitively deal with thorny social problems," according to Spiralis director Jolana Turnerová. "They have a lot of experience, but often face challenges in explaining their work or expressing their needs in an effective manner. We want to change and give these women a chance to realize their contribution to society, make their contributions visible and tangible, and to exercise their influence. We want to expand the gallery of inspiring women who are changing the world." During the next year, program participants will meet in person twelve times, to reinforce and assert the spirit of the motto: "We are clever by ourselves, but together we are brilliant". Academy participants represent both leades in Czech non-profit organizations and social enterprises. The roster includes: Aperio - Společnost pro zdravé rodičovství, Babi.cz, Centrum kompetencí, Člověk v tísni, Dobrovolnické centrum Ústí nad Labem, z. s., Domov Sue Ryder, Dotek, o.p.s, FOKUS, z.ú, Komunitní škola Roztoky, KRUH, LOCIKA - centrum pro děti ohrožené domácím násilím, MINERVA21, Monastery, z.ú., MOST PRO o.p.s, Moudré podnikání žen, Nadační fond Lucie Šafránkové - With Love, Nadání a dovednosti o.p.s, Na Zemi, o.s., Neposeda, Novida Praha, POHODA – společnost pro normální život lidí s postižením, o.p.s., Rodinné centrum Litomyšl, Sdružení D, Spondea, o.p.s, a iniciativa Awen Amenca. The Academy also connects Czech experts as mentors from a number of professional spheres, including: Agentura pro rozvoj Broumovska o.s. (APRB) (Broumov Region Development Agency), CoCuMa (Company Cultural Market), Česká pojišťovna, a.s. (Czech insurer), ČSOB, Expertis, Exxon Mobil, LEGO, VIA Foundation, Patagonia, Skoda Auto, as, Y Soft Corporation, Inc. These experts will apply their practical leadership skills with the women leader participants, in order to increase participant's abilities to gauge the value and impact of their charitable work. The Leadership Academy program is provided under the auspices of United Nations Information Centre – Prague, with financial support from the European Social Fund. The NGO Sector Development Platform steering group met January 2017 in Prague to determine the essential themes and critical issues to be addressed for the coming year. The NGO Sector Development Platform develops resource strategies for Czech Republic organizations navigating the complex jungle of laws and regulations in light of the new Civil Code. By combining the experience of sector organizations with the knowledge of experts from the accounting, legal, finance, and policy fields, the NGO Platform works to identify challenges and to develop solutions facing Czech non-governmental, charitable, nonprofit, and philanthropic entities. The steering group [pictured] included Lenka Deverová, Roman Haken, Radek Hanačík, Petr Pajas, Jolana Turnerová, Miriam Vránová a David Záhumenský. At the conclusion of the meeting, the steering group laid out its plan for engaging the broader NGO Sector Development Platform network, to create clear and effective guidance for Czech organizations regarding the legal obligations and financial requirements placed upon the sector. Program is realized with financial support of European social fund. We can’t imagine world without organizations, which help the needy. As a proof of respect to their work we are comming with unique concept, which helps (makes space?) for individual and profesional development and connect women who are leaders (heads) of reputable NGOs. We introduce new ways how to be seen, heard and have an impact in society. We chose leaders in the field of marketing, personal brand, leadership, storytelling, PR, mapping of key competences, finance, fundraising, strategies. Those people humbly offer their know-how to discover and strengthen leadership of civically active women. We pay attention also to rest and we will work with word “wellbeing”. We combine baths for leaders with vocational trainings, workshops, consultations and individual mentoring. Based on this support participant make (process?) their intention to be financially sustainable. One of outputs of LA2017 will be filmed informationally and emotionaly balanced story good for (suitable to) present those leader women to theit donors, partners and public. Program is realized under the auspices of the UN Information Office in Prague and with financial support of European social fund. Spiralis connected Czech leaders, communities, and civil society institutions to create a network of anti-corruption activity, rooted in the principles of local empowerment and national resource sharing. In November 2015, Spiralis convened a national anti-corruption development network conference at the United States Embassy in Prague, featuring opening remarks by U.S. Ambassador Andrew Schapiro. More than 60 leaders participated from the civic, public service, non-governmental, and business sectors. Throughout 2015, Spiralis also hosted two regional workshops for local leaders to exchange their ideas and experiences for engaging communities in anti-corruption efforts through community development and volunteerism. Support for this initiative was provided through the US Embassy of Prague. Project was supported by the US Embassy of Prague. This ongoing initiative empowers Czech women to strengthen and assert their personal abilities and talents for professional and lifetime success. Our unique program model is centered around peer support, leadership development, and collaborative decision-making to identify and work through specific topics of concern. More than 220 women have participated to date. Support for this initiative was provided through the Open Society Fund Prague. Thematic Network for New legislation creates a system of nationwide information centers. There will be over 20 regional representatives trained in the field of new legislative. The role of the network is to pass the information regarding new legislative changes to NGOs in regions and among their key NGO partners. Project gathered experts on the new civic code and with their cooperation is giving the most accurate information to regional partners, who, then inform the representatives of NGOs. The services provided by regional partners will play a very important role in the profesionalization of non governmental sector, its stability, sutainibility and good name. Project also gathers feedback and various cases describing the practical impact of the New Civic Code on the every day life of the Non government organizations. From July 2012–February 2015, this 32-month project provided a comprehensive education and training programme to promote flexible working time arrangements among public- and private-sector employers. Developing flexible employment opportunities, based on the principle of transitional transfer of innovation, creates positive systemic change for workplace communities and greater economic opportunity for society. Spiralis served one of four partners to the lead agency Channel Crossings, along with FIAP e.V. (Germany), Vårgårda kommun (Sweden), and Muster-in (Poland). The project was supported by the European Social Fund, through its Human Resources and Employment Operational Programme, and the State Budget of the Czech Republic. During 2012-2013, Spiralis undertook an ambitious national outreach project to connect Czech citizens with non-governmental organizations in their communities, through cultural, educational, and volunteer activities. This effort also provided a knowledge sharing framework among more than 200 Czech organizations, to inform and improve their service delivery and community relationships. The project had the patronage of the UN office in Prague.